I had a big brainstorm about the kind of candy I want to showcase with my books today, but of course I didn't have them at home. No worries, just a quick jaunt out to grab some candy on the way to work! 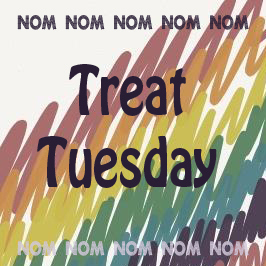 If you want to participate in #TreatTuesday - it's super easy. 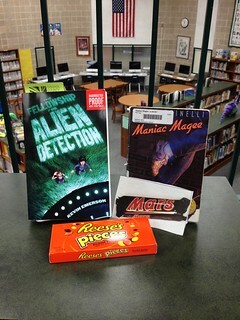 Just snap a photo with your chosen treat and a book you'd like to show off. Post it to your blog or just tweet it out with the tag! Thanks to @NikiOhsBarnes at Daydream Reader for this fun idea. The Fellowship for Alien Detection by Kevin Emerson. This is an ARC and the book comes out in February. Very fun so far! Can you figure out why I chose the two candies that are in the photo? I had to cheat a little, because the store didn't have any Mars Bars!